Major Solar Flare Erupts, May Make Auroras Visible in Northern U.S. The sun unleashed another major solar flare Wednesday (March 9), a solar storm so powerful it could spawn dazzling northern lights displays that could be visible from even New York City. The solar flare erupted at 6:23 p.m. EST (2323 GMT), letting loose a wave of charged particles that is aimed straight at Earth and should arrive in the next few days. "This flare could make the Northern Lights visible as far south as Washington State, central Idaho, northern Wyoming, the Dakotas and east to Chicago, Detroit, NYC and Boston," explains SPACE.com's skywatching columnist Joe Rao. "Of course, we have to hope that the subatomic particles emitted by the flare arrive at the Earth's vicinity during the nighttime hours and of course, that skies are clear!" Predicting the effects and arrival time of solar storms is very difficult, however, so while the light storm could reach Earth tonight (March 10) it's not certain it would be visible so far south. Also, bright city lights could render the sky show difficult or impossible to see. 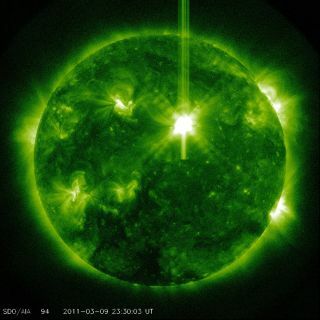 The mega sun storm registered as a Class X1.5 event– one of the most powerful types of flares – and erupted from a region on the sun near a sunspot called 1166. It is the second solar flare of this magnitude to occur in the last month. A Class X2.2 storm erupted from the sun on Feb. 14 and was the most powerful solar flare in more than four years. In addition to radiation, solar flares can kick up massive eruptions of charged particles and magnetic plasma in what scientists call a coronal mass ejection. According to Spaceweather.com, a website that monitors space weather and skywatching events, Wednesday's flare may only be the beginning. The National Oceanic and Atmospheric Administration is predicting similar events for upcoming days. "After four years without any X-flares, the sun has produced two of the powerful blasts in less than one month: Feb. 15th and March 9th,"Spaceweather.com wrote. "NOAA forecasters estimate a 5 percent chance of more X-flares during the next 24 hours." When aimed in Earth's direction, strong solar flares can potentially disrupt satellites and power grids, as well as pose a hazard to astronauts on spacecraft. They can also spark dazzling shows of the northern lights, or aurora borealis. "An X1/2B flare certainly has the potential of producing bright auroras across southern Canada and the northern United States," Rao said. NOAA space weather officials measure aurora activity using a scale called a planetary K-index, which rates activity levels from zero to nine. Aurora activity from this latest solar flare could reach a K-7 on that scale, Rao explained. That suggests northern lights activity could be visible across much of Canada and the uppermost states in the United States, according to a NOAA graphic. The sun has been extremely active over the last month. In addition to the major X2.2 class flare on Feb. 14, a powerful storm on Feb. 24 unleashed what NASA scientists called a "monster prominence" – a huge tendril of magnetic plasma – from the surface of the sun. Between Feb. 24 and Feb. 28, NASA's twin Stereo satellites observed an intense coronal mass ejection erupted from the sun's far side, flinging an enormous tongue of plasma out into space. That storm, however, occurred on the opposite side of the sun from Earth, so it posed no threat to satellites, spacecraft, communications and power grids or other terrestrial infrastructure. Another major storm erupted on March 7 from the region near a sunspot called 1164. That solar eruption kicked up material at a super-fast rate. The plasma wave was measured at a speed of about 1,367 miles per second (2,200 kps) – about 4.9 million mph – making it the fastest coronal mass ejection seen since 2005, according to Spaceweather.com. NOAA officials said the charged particles from that sun storm event should be reached Earth by today (March 10). The sun is currently in the midst of an active phase of its 11-year solar weather cycle. The current sun weather cycle is known as Solar Cycle 24.